Meade Sutterfield (center) with CELA members. Meade Sutterfield is a private equity investor, primarily in emerging telecommunications and wireless communications entities. He was for years an entrepreneur, having been at Scientific-Atlanta when the cable business was created and as a business owner and CEO for two of the businesses participating in the roll-up that created Nextel Communications. However, Mr. Sutterfield is also a committed philanthropist and social entrepreneur. In 2002, he, as a member of theSociety of International Business Fellows (SIBF) and East West Institute (EWI), was one of the founders of the Central Eurasia Leadership Academy (CELA). CELA is a multicultural initiative promoting regional cooperation by fostering the development of mid-career professionals in the Caucasus, Central Asia, and Afghanistan. 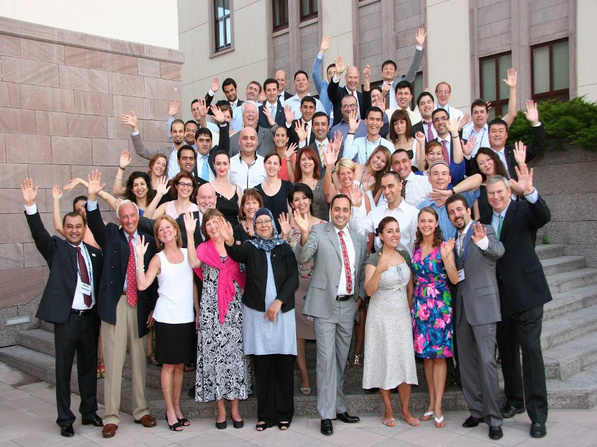 Each year CELA recruits and selects a cadre of young professionals and emerging leaders from nine Central Eurasian countries and connects them through a 10-day networking and capacity-building training event in Istanbul—a successful model that has since sparked spin-offs in three other regions. We recently spoke to Mr. Sutterfield about the vision and strategy behind CELA and his integral, long-term commitment to this initiative. Why did you decide to become involved with CELA? How would you describe CELA’s mission today? We started working on CELA in 2001 as a response to 9/11. We wanted to do something to bring people together and promote regional cooperation after that incident… CELA’s mission today is to empower leaders to work together with integrity and to create value for our members and the region. What have been the key performance indicators that you have watched, and key outcomes you’ve observed? We have an application pool that’s about three times the number of participants we can accept. We monitor the quality of applicants we receive and admit, and the professional level of the participants has improved substantially. We have something we call the Collaboration Sheet; it is now probably seven pages long of collaborations where two people meet in CELA and do something together that benefits their governments, NGOs, or businesses. These projects cross borders and CELA alumni are a part of everything—as prime ministers, MPs, ambassadors, mayors, NGO leaders, entrepreneurs, and owners of small-medium sized enterprises. There’s almost nothing going on in Central Eurasia that doesn’t have a CELA handprint on it somewhere. For instance, Pamir Energy in Tajikistan started selling across the border into Afghanistan because one of the managers running Pamir Energy and one of the development vice-ministers in Afghanistan were in the same CELA class. They hammered out how the Tajik company could sell electricity into northern Afghanistan and start electrifying a previously dark area. That started purely from that connection at CELA, and that’s just one of hundreds of good things that have happened. The main metric, though, is that we’re not a fully donor-supported program anymore as we are moving toward sustainability with 55% of the money coming from the members. The fact that the network is worth it to the participants is the most powerful measure because they’re using their own scarce dollars to support the program themselves. If something can’t be sustainable from its members, then I think that it probably doesn’t need to be. People pay for what’s important. How have you built strategy and sustainability into CELA? What have been some challenges with this? The biggest challenge was that it took from 2006 until 2010 to just start the process for CELA to be a self-sustainable program. I don’t think many in CELA or SIBF believed it was possible for CELA to provide its own leadership and financial support. And so that was the first thing, just to put forward the notion that sustainability was not a pipe dream. Until 2010 the entire program was 100% financed by donors. Now in 2015 it’s 55% financed our CELA members, by tuition, dues, attendance fees for programs, fundraiser events, and gifts from these members; our goal is to get to 100% member contributions by 2020. The greatest innovation toward sustainability was in 2010, when a Board of Directors of nine members from the country teams was elected by the CELA members themselves. There were initially five SIBF members on the Board, and now there are only two; the remaining nine are still CELA members from each of the nine countries. The real thing is that they, the CELA participants, are now responsible for the strategy. We’re on our third CELA member chair, Hikmat Abdurahmanov, and he has just finished a comprehensive strategy document through 2020, and it’s the best piece of work that’s even been done in CELA in terms of strategy. Now, sustainability is built in because the organization has a more corporate-type governance made up of members themselves. The fact is that clarity of purpose is so important. You cannot have the same purpose forever except at a broad human level, so you have to change. The Board has allowed CELA to change… the spirit is still there, but the specifics of what we do are able to change. Mr. Sutterfield (back, center) with CELA Academy facilitators and participants. How has CELA merged business with philanthropy while upholding its social mission? I think if CELA had remained a philanthropic enterprise it would have died. It wouldn’t have been sustainable because of the sheer amount of money it took to run it. Most philanthropic programs are never really sustainable. Now, the participants pay tuition, and that’s a huge shift because now there’s money in the game from the beginning, and we’re getting business people, academic leaders, and NGO leaders who are serious about the education and the network. We’re getting more focused, more senior people. The marketplace in business requires that you have to be financially sustainable. This factor is why corporations tend to be much sharper in the way they are managed. What CELA stands for now, in terms of the broader human aspect, is no different than it was when it was started. However, the underlying programs, the nature of the speakers, how meetings are run, has changed to reflect value as perceived by CELA members. There are now three CELA spin-offs, Middle East Leadership Academy (MELA), North American Leadership Academy (NALA), and South East Asia Leadership Academy (SEALA). Why do you think CELA is an important model to support and replicate? Initially it was the opportunity to impact these young lives. So many of us in SIBF are successful entrepreneurs. The development of people is something as an entrepreneur you have to do, because that’s how you build a business is to build people. Ultimately, the interdependence and inter-networking of CELA, MELA, NALA, and SEALA means that at some point this will be quite a significant network. The unique learning model of these academies requires 20-25 people in faculty, facilitator, and support roles for a class of 40 participants. I think the proof in the pudding is that our members from SIBF have put in over a decade of their time and the money to build these Academies. Starting an academy is almost a full-time job for the first few years. As a further indication of integration and sustainability, members of the SEALA, MELA, and CELA networks will serve as facilitators alongside SIBF members at this summer’s 11th CELA Academy. This trend toward member facilitators has been building for four years and is a part of our sustainability push. You and your colleagues have been leading and sustaining CELA for 15 years. What does a philanthropist or social entrepreneur need to consider when committing to a project long-term? You can achieve far greater results with time. There’s a longer term commitment that is required for almost any real change. Things have to evolve at the pace they do. When everything’s done from an outside point of view, it’s very hard to create real change without going through an entire generation. I’m a businessman, and this is a business principal: things take how long they take. You have to be committed to making an idea work, and some ideas come out and within a year or two you have WhatsApp, but some things take longer—Nextel took 8 years. I do liken it to having children: if something is worthwhile, it takes time and commitment. The personal aspect is perhaps even more important. We have had nearly 100 SIBF-affiliated people personally participate in CELA, MELA, NALA, and SEALA. We all pay our own way and give our time. The spirit that SIBF members, faculty, facilitators, interns, and office people bring—that volunteer spirit just floors people. Why are you doing this? I have been asked that question hundreds of time. Why do you do this? To give without any expectation of return is such a phenomenal thing to experience on either side of the giving, and it changes people forever. That is why it is so encouraging to see members of the CELA, MELA, NALA, and SEALA networks giving their time as volunteers to build this experience for others. The volunteer spirit that exists, this passion, is what changes things. 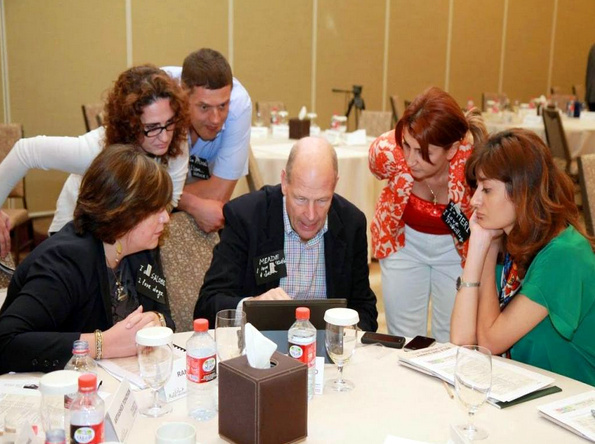 Photos via the Central Eurasia Leadership Academy. Learn more about CELA at its website and Facebook page. No Replies to "SUSTAINABILITY, COMMITMENT, AND THE VOLUNTEER SPIRIT"